The Active Lives Survey is a way of measuring sport and activity across England. Within schools the survey will give an understanding and key insight of children aged 5-16 of their habits, attitudes and behaviors around sport and activity. 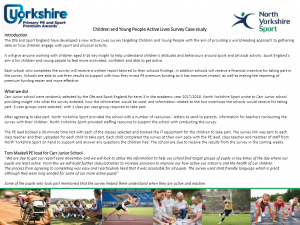 The survey sits at the heart of Sport England's vision "Everyone in England, regardless of their age, background and level of ability, should feel able to take part in sport and activity"
North Yorkshire sport are delivering the Active Lives survey on behalf of Sport England. Schools are selected by Sport and England and then will be contacted by ourselves to arrange and compete the survey. One class in up to three different year groups will be asked to fill out the questionnaires. The questionnaire has been tailored to meet the requirements of different age groups to ensure it is simple and enjoyable to complete. The surveys take 20 minutes to complete and can be carried out on Desk top computers, Laptops or Tablets. Alongside this it is asked that one teacher per school completes a 10-minute survey to provide broader context to the pupils responses. Should your school be requested that participants are in year 1 or 2 we are asking that parents also complete the questionnaire to provide further information about their child's physical activity behaviours. 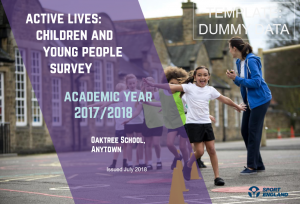 We recently worked with Carr Junior School to complete the active lives survey and carried out a case study which can be viewed by clicking on the above image. All schools that take part will received a bespoke report summarizing their own results (providing that at least 30 pupils complete the questionnaire). 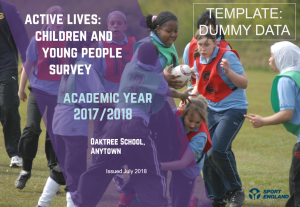 This report will include measures of children's activity levels, physical literacy, swimming proficiency, wellbeing, self-efficacy and levels of social trust. Each school who participates will also receive £100 to thank them for their involvement in the study. Click on the image to the right or below for example tailored reports. Schools are randomly selected however if your schools wishes to complete the survey voluntarily the option is available. If your schools opts in voluntarily you will not receive the cash reward however will receive a tailored report summarising findings.